Their predictions might make sense based on the national financial model they're familiar with, neoliberal Western Capitalism, but make no sense when applied to the Chinese model, which we might call Predictive Economics: the Chinese government, like Babe Ruth, calls its shots in advance: it tells people where the country needs to be in five years and what everyone has to do to get there. Then everyone does their part: not so hard when shared with 1.3 billion other people. The banks, which are collectively owned, have been consulted about the five year plan and are on board. So are the SOEs whose only job it is to supply cheap energy and commodities. And so are the entrepreneurs who know that the railway will be ready when they build their new factory in some poor, remote province whose turn it is to develop. Multiply this by 1,000 programs large and small and you can see how the country can move so fast. But Western 'experts' and economists refuse to acknowledge that this form of integrated government can work at all, let alone work well. That's why all the thousands of Western predictions have been wrong–for seventy years. 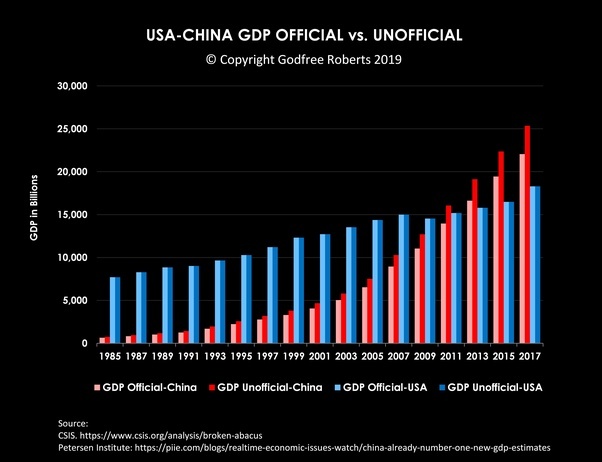 Meanwhile, China's economy eclipsed the USA's and the EU's to become the largest on earth in 2010 and, by the end 2019, it will officially be $25 trillion while America’s will be $19 trillion. Our 'experts' are left with but one face-saving option: cast doubt on the reliability of China's reported figures and equate China with Enron. David Stockman, the otherwise sane former Budget Director, called China ‘a Ponzi scheme’. There are hundreds of opinions like his published every month in our corporatized media. (1) Western economics has zero predictive value. (2) Chinese economics has high predictive value. (3) The Chinese are eating our lunch while media and academics are distracting us with denialist fairytales. Marc Mobius, CEO Franklin Templeton Fund: China's Economy May Be Even Bigger Than You Think "I know there's a lot of debate as to whether the numbers are true, whether it's really 7 percent, but our numbers indicate that it is at least that," the chairman of the emerging-markets group at Franklin Templeton Investments said in a recent interview with Bloomberg TV. 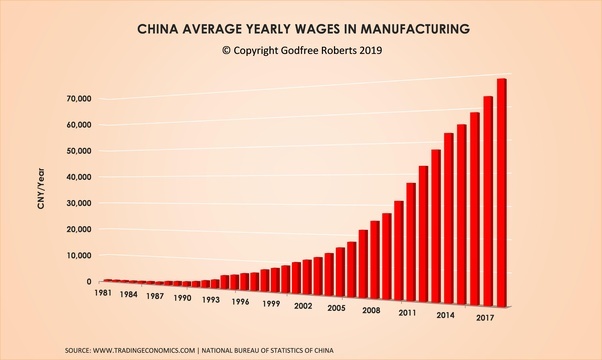 "We think that a lot of the economy is not really being counted because China is being converted from a manufacturing-oriented economy to a service economy." Carsten Holz, Professor, HKUST is a visiting scholar in the Department of Economics at Fairbank Center for Chinese Studies at Harvard University. His research interests include issues of economic development and growth in China. His current research is on the quality of Chinese statistics and on productivity changes across China's economy. Download the paper here. Carsten Holz ─ The Quality of China's GDP Statistics. An official on Thursday blasted reports saying China's growth might be overvalued, warning that the use of unofficial methods and incomplete data failed to give a complete picture. When calculating the growth speed of China's value-added industrial output, some China observers used the weighted average method (WAM), which only counts some industrial output, Deputy Head of the National Bureau of Statistics (NBS) Xu Xianchun said in a statement. WAM does not result in accurate data because it only samples a few products, including coal, oil and steel, and fails to reflect the quality improvement of products. The NBS on Tuesday released the major economic indicators for December and all of 2015. China's economy grew 6.9 percent year on year in 2015, the slowest annual expansion in a quarter of a century, while growth in the fourth quarter came in at 6.8 percent year on year, the lowest quarterly rate since the global financial crisis. The naysayers also underestimated the rapid development of the service industry, including the financial sector and the Internet, since the new millennium, thanks to improved labor productivity, Xu said. Xu noted that to improve transparency China has used the Special Data Dissemination Standards (SDDS) system, which was created by the International Monetary Fund (IMF), since October 2015. The SDDS is used by IMF members that have, or are seeking, access to international markets in contrast to the General Data Dissemination System, which applies to all IMF members. China's practice is in line with international standards, Xu said, and its data is accepted by international organizations including the United Nations, the World Bank and the IMF. In fact, China's Economy May Be Even Bigger Than You Think and, in any case, China Is Changing How It Reports GDP to Meet IMF's Standard.